Nitric oxide, in bright blue and red, is attached to a specific cysteine in each of the beta chains of hemoglobin. Our circulatory system has been finely tuned through evolution to deliver oxygen quickly and efficiently. Hemoglobin is a perfect example: through its complex allosteric motions, it picks up large quantities of oxygen in the lungs and drops most of it off throughout the body. Tissues that need more oxygen can increase their share even more by dilating nearby blood vessels, so that more blood flows through and more oxygen is released. Surprisingly, hemoglobin, with some help from nitric oxide gas, is also a key player in this control of blood flow. Nitric oxide, created by nitric oxide synthase, is a signaling molecule used to control, among other things, dilation of blood vessels. When activated, it also forms readily-reversible complexes with cysteine amino acids in proteins. These properties are combined to create a self-regulating system for blood flow. First, nitric oxide forms a complex with a specific cysteine on the beta chains of hemoglobin, binding preferentially to the oxygenated form. Then, as the blood flows through the tissues, hemoglobin releases its oxygen and changes shape to the deoxygenated form, causing release of the nitric oxide. Finally, it is transported out of the red blood cell and induces the surrounding blood vessels to dilate, increasing the flow of blood through the tissue. In this way, hemoglobin acts as an oxygen sensor as well as an oxygen carrier, releasing nitric oxide in regions where oxygen is needed most. This function is so important that this cysteine (Cys93beta) is one of only three amino acids in hemoglobin conserved across all mammals and birds (along with two that position the heme). The reaction is also quite specific. Hemoglobin has several other cysteines, but as seen in PDB entry 1buw, nitric oxide attaches preferentially to this one cysteine in each of the two beta chains. S-nitrosylated thioredoxin, with the nitric oxide in bright blue and red and cysteine sulfur atom in yellow. Many different proteins are regulated by addition of nitric oxide to key cysteine amino acids. This reaction occurs through several different mechanisms, including direct transfer between cysteines and with the help of specific enzymes. Thioredoxin is thought to play a central role as a convenient carrier in the transfer process. As seen in PDB entry 2ifq, nitric oxide reacts with a cysteine on one side, which then can act as a donor in reactions that transfer the nitric oxide to a target protein. The structure of S-nitrosylated hemoglobin (PDB entry 1buw) was determined by starting with crystals of hemoglobin with carbon monoxide, and then exposing them to nitric oxide gas. Since the carbon-monoxide-bound form has a similar structure as oxygenated hemoglobin, only small changes occurred when nitric oxide attached: two amino acids at the end of the chain (numbers 145 and 146) became disordered. To explore the structures of S-nitrosylated and carbonmonoxy hemoglobin (PDB entry 1hco), click on the image for an interactive JSmol. Myoglobin in some cold-blooded animals is also regulated by nitric oxide. 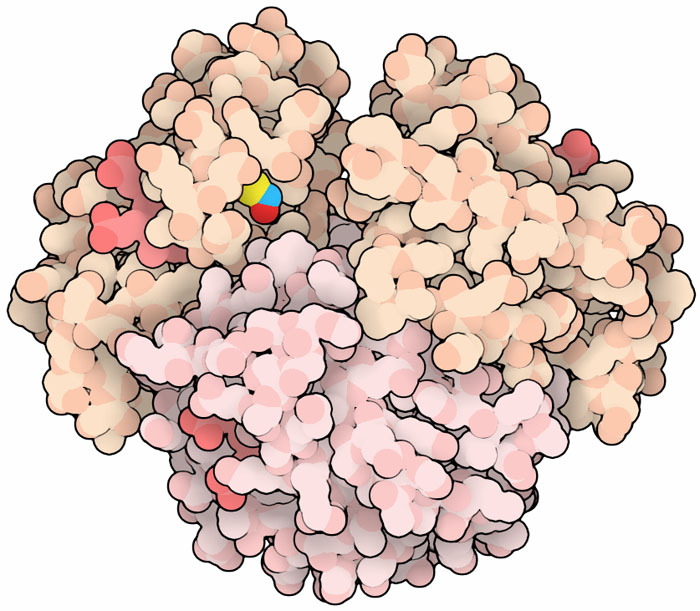 Take a look at PDB entry 2nrm to see S-nitrosylated myoglobin from tuna. The PDB archive includes many other S-nitrosylated proteins. Look at the list included on the ligand page for SNC (S-nitroso-cysteine). Zhang, R., Hess, D.T., Qian, Z., Hausladen, A., Fonseca, F., Chaube, R., Reynolds, J.D., Stamler, J.S. (2015) Hemoglobin betaCys93 is essential for cardiovascular function and integrated response to hypoxia. Proc. Natl. Acad. Sci. USA 112, E2846. Evangelista, A.M., Kohr, M.J., Murphy, E. (2013) S-Nitrosylation: specificity, occupancy, and interaction with other post-translational modifications. Antioxid. Redox Signal. 19, 1209-1219. Gould, N., Paschalis-Thomas, D., Tenopoulou, M., Raju, K., Ischiropoulos, H. (2013) Regulation of protein function and signaling by reversible cysteine S-nitrosylation. J. Biol. Chem. 288, 26473-26479. Weichsel, A., Brailey, J.L., Montfort, W.R. (2007) Buried S-nitrosocysteine revealed in crystal structures of human thioredoxin. Biochemistry 46: 1219-1227. Chan, N.L., Rogers, P.H., Arnone, A. 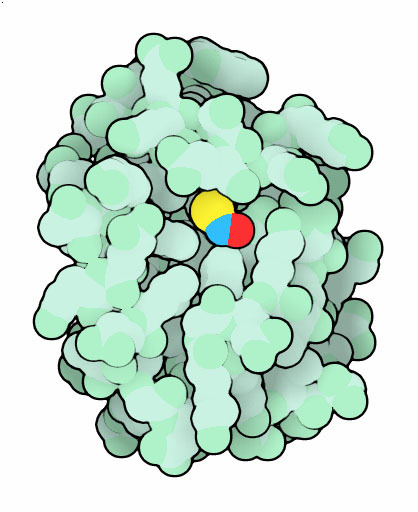 (1998) Crystal structure of the S-nitroso form of liganded human hemoglobin. Biochemistry 37: 16459-16464. Baldwin, J.M. (1980) The structure of human carbonmonoxy haemoglobin at 2.7 A resolution. J.Mol.Biol. 136: 103-128.